Dog bites are unfortunately a common occurrence in New York City. Many times the person bit and the dog owner are left wondering what exactly happened to trigger such a reaction from an otherwise amicable pet. But even the friendliest Frenchie can act aggressive, either in a fearful way, an offensive way, and/or a defensive way. Although I am in no way a certified animal behaviorist or trainer, my experiences within the veterinary profession and as a dog owner of 16 years have taught me to read some very telling canine body language that I am excited to share with you. It is important to understand that this list is not exclusive as it is just based solely on my experiences. Also, just because a dog may not exhibit the signs discussed does not guarantee that you won’t get bit because any dog can quickly turn if they are startled by something unexpected. 1. Don’t be fooled by a wagging tail! – Just because you see a wagging tail doesn’t mean that it’s a friendly gesture. In fact, dogs will frequently wag their tail when they are aroused in any way. 2. Standing fur does not mean they’re cold! -Another sign of a very aroused dog is when fur along the neck, back, shoulders, or tail stands up. 3. Be cognizant of a dog that is pacing and avoiding you. – These pets are stressed and likely fearful of the situation they are in. It is best to just let these pets relax by leaving them alone. – It is unwise to startle any dog. Many dogs will act in self-defense in these situations, even if they really did not mean to hurt their loved ones in any way. – The “whale eye” is an interesting gesture that I had the hardest time understanding myself. I have also heard it called the “side eye.” This gesture is when a dog has fixed their eyes on you with their head slightly averted. You frequently will see the whites of the eyes in a half-moon shape. These dogs would much rather avoid you than hurt you but if pushed, can become aggressive. 5. Evade dogs with ears pinned back or head held low and growling. – This one may be obvious, but it is an important way of a dog telling us to back off! 6. Avoid a dog that is trying to look big. – What I mean by this phrase is a dog that is standing on all four legs squarely with his ears and tail held up. Although this may mean a dog is just aroused and aware of the surrounding environment, this may mean that he is standing his/her ground too! 7. Avoid prolonged direct eye contact. – I frequently catch people making this mistake. In human language, this is a sign of respect and attentiveness during conversation. However in dog language, this is a sign of aggression and confrontation. So please avoid this, especially if you are meeting a dog for the first time! 7. 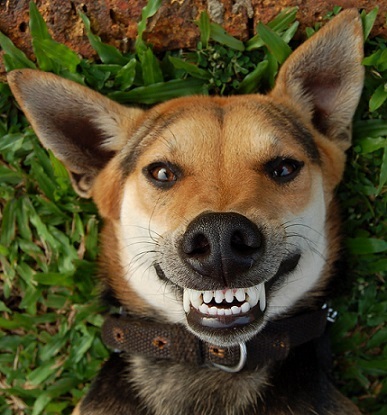 Stay away from a dog that is showing teeth and growling, snarling, or barking. – A dog can’t tell you to stay away in a more obvious way! So always, always, always, approach each dog with caution and consideration and remember to ask the owner of the pet first before you reach out! And if you want to approach that jovial Jack Russell that lives down the street, look out for some of these common signs before you make your move! My pet was diagnosed with kennel cough: what does this mean?